If you’re somehow involved in the kidlit publishing world, you’ve almost definitely heard of Christian Trimmer, Editorial Director of Henry Holt Books for Young Readers. 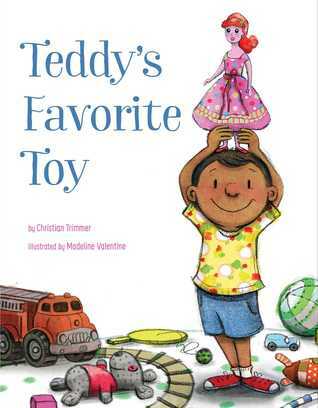 But he’s also an author, most recently of the picture book Teddy’s Favorite Toy, about a little boy whose favorite toy is a doll. He’s here today to talk about the personal experience that inspired the book and the growing conversation about gender nonconformity. Though I try to keep my promise to my dad, I fail. But I learn to keep my preferences hidden. I only play with Wonder Woman when I’m alone. I look forward to playdates away from my home, particularly with Muriel, who is French and has all of the Strawberry Shortcake dolls and is happy to share them with a boy. When I play superheroes with the other kids in the neighborhood, I whisper my chosen character—Wonder Woman, naturally—to my brother and him alone. As I get older, I start to collect more gender-appropriate toys: the Masters of the Universe and Thundercats. Teela and Cheetara are my favorites, but it is easy enough to keep that hidden among their all-dude colleagues. Still, I’m not behaving the way a boy should. I’m teased at school. I try to be what they want me to be and fail again, and the layers of shame are getting deeper. I’m given mixed messages from my mom: “Don’t let their teasing bother you, they’re just jealous. But you better not be gay.” I am gay, and I don’t talk about it in front of her for years to make sure she feels comfortable. That approach—put others comfort before your own—becomes second nature in most of my relationships, personal and professional. It is exhausting. I just wanted to play with a doll! Years later, I write a picture book called Teddy’s Favorite Toy about a kid and his favorite doll and their awesome adventures. His mother doesn’t care that he loves this doll—she celebrates it. As I’m working on the manuscript, Target announces that it will stop labeling toys for boys and girls. On the day we announce the deal, Mattel runs a Barbie commercial featuring a boy for the first time. The outrage that accompanies both events is muted by the overwhelming support. Though I was raised in an era that shunned and shamed its effeminate boys, I found a way to move past traditional ideas of masculinity, to use more of the canvas. Therapy absolutely helped, as did an intelligent, open-minded circle of friends. Living in New York City made everything seem possible—I highly recommend it. Being gay, the ultimate affront to traditional masculinity, revealed to me the limitations put on straight men in terms of the careers they are “allowed” to pursue and the way they approach relationships. I highly recommend it. I have friends with small children, and it’s amazing to see how gentle and encouraging they are with them. I hope that for every child—that they get to be themselves and experience the world without limits. I wrote Teddy’s Favorite Toy for all the little kids who maybe like things they’re not supposed to. I wrote it for the parents who allow their kids to explore the world unfettered. Most of all, I wrote it for five-year-old me, who was made to feel ashamed for loving a doll.